3. Take Pictures: Members of a hiring committee interviewing an unfamiliar candidate may struggle to visualize the candidate leading a classroom, particularly if they are coming right out of teaching college and/or are very youthful. Be sure you have a clear understanding of what photography is acceptable under the student privacy procedures of your host school. Sometimes you have to get creative like only taking pics from the back of a class or sending home a release letter to parents of students pictured. However, it is worth the time and trouble. Not only will it help the hiring committee to easily envision you directing a classroom, it is the perfect touch to compliment the progression artifacts described above. 4. Clean Up Your Digital Footprint: Whether it is fair or not, hiring teams are increasingly hitting Twitter, Facebook, Google, Instagram etc. to find the ‘real you.’ When schools hire teachers for even a day, they are entering into a costly relationship that can be difficult to exit. They need to be sure the candidate at the teacher interview is the same person they will get when the classroom door closes. As someone entering the teaching profession, you take on the burden of a higher standard out in the digital world. Privacy settings are only partially effective in keeping others from seeing your online social life. The good news is that you have a few months to get things cleaned up. Check all your, posts, pictures, user names and even outgoing voicemail messages to be sure a group of stakeholders looking to hire you would see you as a person who is ideal to work with children and worth the investment. 5. Network and Be Nice to Everyone: Everyday as a student teacher (or substitute teacher) is an interview. You should look to impress and meet more than your cooperating teacher or administrators. You can never tell who is going to put in a good word about you (or bad word) from the school secretary, to custodians to parents. So make every relationship count. Introduce yourself to all that you encounter from high to low and be sure that your interactions are more than transactional. Schools are small communities. People talk within communities and amongst school communities. Your relationships will have a ripple effect that can either help to propel you when an opening arises or quickly end your opportunity without your knowledge. 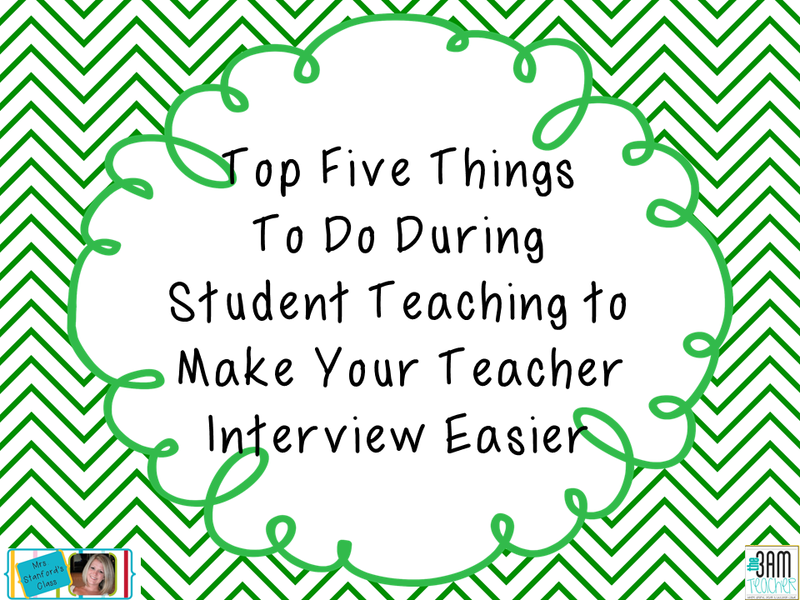 Attend to these five things for now and you will be well ahead of the game when you have less on your plate and can begin your teacher interview preparations in earnest. Thank you to our friend Heather (aka HoJo) for everything she does to make the lives of teacher and future teachers easier! Dr. Kresse and Dr. Vallely (Bill and Mike) are the authors of the groundbreaking book, The Insider’s Guide to the Teacher Interview (2012), and founders of the theEDUedge.com which provides free resources and support for teacher interview preparation. Veteran school leaders, the authors are dedicated to studying and sharing insider information on the teacher interview in order to reduce stress among teaching candidates. Bill and Mike present at teaching colleges regularly or as much as their wives will allow them. The authors can be reached at info@theEDUedge.com.